RIO DE JANEIRO, BRAZIL – Amid worldwide criticism and ridicule following his team’s unceremonious exit from the 2018 Russia World Cup, Brazil’s mercurial star forward, Neymar, received words of support this week from another Brazilian football (soccer) great, ‘O Fenómeno,’ Ronaldo Nazario. This week, Neymar received support from fellow Brazilian soccer great, Ronaldo ‘Fenómeno,’ photo internet recreation. Neymar was a divisive figure throughout the 2018 Russia World Cup. On the one hand, he showed flashes of brilliance, with stepovers, dribbles, and backheels that few could execute. But, for many, the world’s most expensive player had a World Cup run that fell well short of expectations, with Neymar netting only two goals and two assists in five World Cup games. Even worse perhaps will be the lingering images of Neymar’s perceived dives and over-acting throughout the tournament, especially when he was rolling on the deck writhing in pain after being stepped on by Mexico‘s Miguel Layun. That moment produced a flurry of internet memes ridiculing Neymar’s apparent theatrics and has even led to the viral #NeymarChallenge where people dive and roll on the ground in an attempt to mimic the Brazilian superstar. Ronaldo, who led the Seleção to their last Cup title in 2002, and one of the few individuals in the world who can relate to the wave of criticism Neymar is receiving at the moment, had some advice for the young superstar. 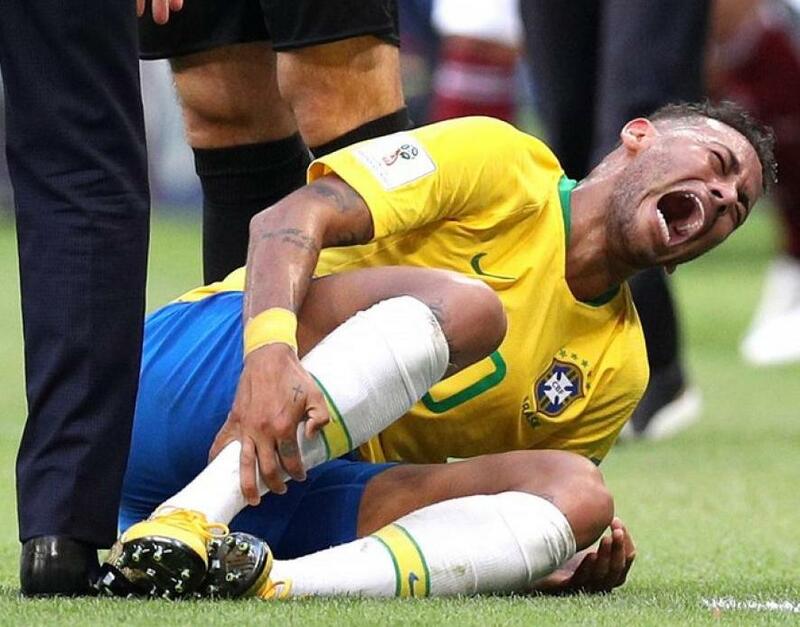 Neymar’s rolling on the field writhing in pain in Brazil’s match against Mexico has led to countless internet memes ridiculing the Brazilian forward, photo internet reproduction. Neymar has not spoken to the media since Brazil’s disappointing 2-1 loss to Belgium in the World Cup quarterfinals on Friday, July 6th. But, following that match, the 27-year-old did turn to social media, releasing an emotional statement on Instagram.